In the Principality of Moscow and the Russian Empire the presence of Jews was not tolerated since the Middle Ages. Jews were considered the enemy of Christ by Orthodox Christianity and believed to aim at converting Christians to Judaism. The Czars, in their role as Protectors of the Faith, regularly refused permission even for Jewish merchants to enter Russia. When after the partitions of Poland several hundred thousand Jews become incorporated into the Russian Empire, the Russian government immediately perceives them as "the Jewish Problem," either to be solved by enforced assimilation or expulsion. At your right a Jewish family at home. 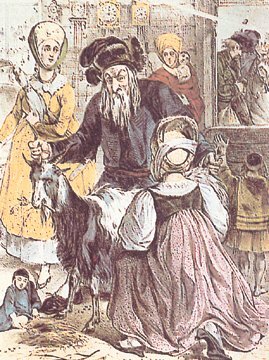 Several Czarist decrees prohibited the traditional Jewish dress such as the caftan worn by the man on the right, and the growing of "peyot," or sidelocks, worn by the boy. Ca. 1843. The first "problem" the Jews pose is to the nationalist or panslavic conception of the Russian Empire. In this conception, the Jews do not fit into the aim to form "of all nationalities a single people" based on "common language, common religion and the Slavic Mir." The second issue is economic: the majority of Jews lives in villages and fulfills a vital role in the village economy. This poses a problem to the feudal order of the Empire, as free townspeople are not permitted to live in villages where both the land and the people - serfs - are the private property of the nobility. The Polish nobility, having lost its feudal rights after the partition, wants to regain the economic functions they once delegated to the Jews - a political demand that Russian governments are eager to accommodate. Both issues, Jewish cultural and religious autonomy and Jewish residence in the villages, are addressed time and again by degrees and counter-degrees. However, both "problems" remain largely unresolved throughout the 19th century. Jews resist assimilation into a society that will only accept them if they renounce Judaism, and prefer their traditional village existence above forced residence in overcrowded cities. 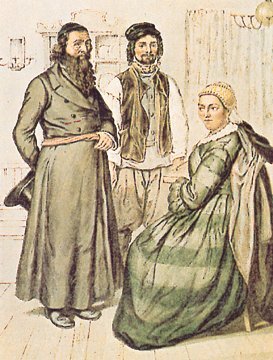 At your left, observe Russian Jews showing the influence of government-imposed dress codes: the traditional caftan has been exchanged for a black frock coat.Lithograph, 1843-44. In his "Statute Concerning the Organization of the Jews" from 1804, Alexander I is the first to formulate the dual policy of forced assimilation and expulsion from the villages. With the aim to draw the Jews into the general stream of economic and cultural life, Jews may now enter public schools for the first time. In order to undermine the Jewish village economy, Jewish residence in the villages is prohibited, and expulsions begin soon afterward. Jews are also forbidden to distill or sell alcohol to peasants, or continue leasing activities in the villages.